Somehow, until recently, the Canary Islands had passed me by. My connections not going beyond thoughts of winter sunshine and volcanic landscapes and, I must admit, suspicions of unfortunate holiday developments. Then I started hearing about La Gomera, just 45 minutes by ferry west of Tenerife; rugged, natural, home to a magical rainforest and an unhurried pace of life. Those in the know, keep returning. The Norwegian Olsen family have long held ties with the Canaries through their shipping interests. Perfecting the art of transporting exotic fruits and vegetables to European markets in the 1920′s and being quick to realize the appeal of cruises to the islands for those of us with cold, grey winters. These days they are one of the key ferry operators providing services between the islands and it’s to their Hotel Jardin Tecina Resort on the sunny south coast of La Gomera that Ian and I are heading. Getting there proves easier and more relaxing than anticipated. I like big margins, had been fretting I’d not left enough time to get from Tenerife South Airport to Los Cristianos to catch the last ferry of the day over to La Gomera. But it’s fine. A RyanAir fanfare trumpets our arrival ahead of time, taxis are waiting and little over an hour after landing we’re shedding layers and enjoying the early evening view over the harbour from the ferry terminal restaurant with other waiting passengers. That getting away from it all feeling is definitely taking over as we sit in the stern of Benhijigua Express soaking up the last of the day’s sun, Tenerife fading into the distance at the end of a broad white wake. The Fred Olsen ferry is an impressive craft, one of those fast, vehicle carrying catamarans that look like a giant Praying Mantis. Swish inside too, with a choice of aircraft style seats in rows or companionable arrangements of comfy chairs and tables. I’m on the lookout for whales and dolphins – this passage between the islands is a noted place to see them – no luck this time though. When we dock in San Sebastian, La Gomera’s capital and main port, the smaller Benchi Express is waiting to take us onward around the coast. It’s an easy transfer; down the gangway, a hop across the bow of the ferry and a few more steps onto a pontoon. “First stop, Playa Santiago”, a smiling crew member informs us. Momentarily the care worn interior is disappointing, then we get going. We can’t see out; it’s too dark by now. The gentle long swell underfoot does it – to think we’re coasting around a sub tropical island in the Atlantic Ocean. From the small former fishing port of Playa Santiago it is only a short ride up the hillside to Hotel Jardin Tecina’s cliff top perch. I’m barely out of the taxi before our bags were whisked away, leaving us to check in pleasantly unhindered. The reception desk occupies a corner of an open plan space with a bar and sitting areas. After the blackness of the night it takes a moment to adjust to the light and colour. Impressions are of white walls, dark wooden furniture upholstered in bold orange and yellow, formal in a traditional Spanish way but more cheery. Telling of the island’s agricultural heritage, a full size press (they were used for pressing grapes to make wine, I learn later) forms a centre piece, while the old world map on the wall and artefacts from around the globe remind of the Olsen family’s seafaring beginnings. Our room is nearby and easy to find, one of a row surrounding the pool area. Whitewashed with a solid door it’s like having our own little house. Inside the style is light and simple, a tiled floor, ample storage in white fronted cupboards, iron work bedhead and fresh inviting furnishings. Time for a quick freshen up before dinner. Maybe in contrast with the new, cleverly fitted ensuite in our room last night at the airport hotel the bathroom looks a tad tired. Neither of us can coax more than tepid water out of the taps either, but it doesn’t matter for now. We are staying on a half board package that includes a buffet dinner in the Principe Restaurant. There’s lots of choice, with a leaning, I would say, towards northern European tastes. The salads are refreshing and my lamb cutlets grilled to order attentively cooked. If you fancy something a little more formal the International Restaurant, also in the main building, has a menu service. Rounding off the day with a glass of local Garajonay wine La Gomera was looking full of promise. The next morning we wake in a new scene. This one has a floral backdrop of beautifully tended gardens bursting with plants from all over the world – bougainvillea, figs, lemons, hibiscus, yuccas … a few I can put names to. Of course, the name – Hotel Jardin Tecina. My late father-in-law once created a cactus garden in the desert, I find myself thinking how much he would have enjoyed this display. Around the world in three hours without leaving the hotel, is the theme of the free weekly guided walk. And if we’d been here on a Thursday you could have counted me in for the Banana Walk in the adjoining plantations. After breakfast – another very generous buffet – we’re given a tour of the hotel by the ladies from the PR office. Admiring the views over the bay from the hotel veranda the conversation is interrupted as a small green plane passes low overhead on it’s way to land at the airstrip on the hill opposite. If you don’t fancy the ferry ride this is another way you can arrive; there are two flights a day from Tenerife North Airport, almost to the hotel door. In many ways the resort is like a cruise ship, everything you might want is on hand, modestly and tidily provided. To give you an idea of the facilities: in the main building we looked in on a small, gym , beauty centre, what you might term corner shop selling daily papers and those small items you might have forgotten, a gift shop and computer room and multilingual library where bridge players can meet to play a hand or two. For active guests besides the complex of pools there are tennis, squash and paddle courts and nearby an 18 hole golf course built on a slope overlooking the Atlantic. I don’t know about the technical difficulties of playing downhill through 175m, but the views are certainly distracting. Undoubtedly you will be tempted to just relax and be in these surroundings but it would be a great shame not to see something of La Gomera and that’s also made easy with car hire on site, and readily available info on walks. bike hire, boat trips, diving …. Strolling around the resort is very pleasant. The 434 rooms, all with a balcony or patio have been sympathetically landscaped into a matrix of charmingly named pathways, with the effect of a friendly village. We’re greeted by cleaning staff and gardners, exchange good morning nods with fellow guests and pass a few words with the young resident tennis coach. There are a range of rooms including family duplexes on two floors, close to the main hotel building rooms with easy access for disabled guests and overlooking the ocean rooms made for romance. There’s one more area we haven’t seen, the Laurel Beach Club at the bottom of the cliff, it has a sea water swiming pool. To get there we take a lift, descend through the rock and emerge from a short tunnel – neat. People have been busy on the beach opposite balancing rocks to make sculptures. A lounge, a dip, and maybe a snack or cooling drink from the poolside Barbecue Club Laurel Restaurant is the way to go here. For a dressier occasion there’s the Restaurant Club Laurel claiming “the best grilled meat and fish under the stars”. Reassurring stone walls and a low beamed ceiling lined with reeds give a cosy atmosphere. On the way out we spot a photo of German Chancellor, Angela Merkel. The restuarant is a favourite we’re told. It’s easy to see the appeal in escaping to the Jardin Tecina: unspoilt surroundings, an enviable climate, a place apart to relax in an unfussed way – and not so far away. 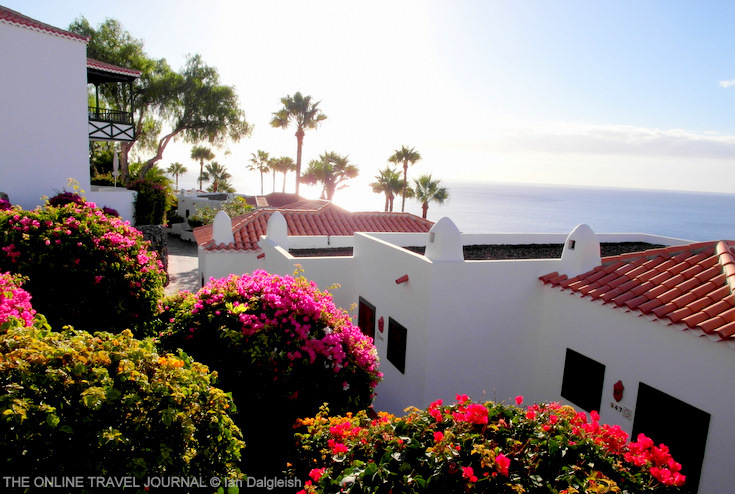 Our ferry crossing and stay at the Hotel Jardin Tecina were courtesy of Fred Olsen S.A.
…Que Belleza de Hotel en Tecina, Sur de la Gomera (donde naci) Felicidades…Feliz dia.